Not far from Bedford on the Adelaide road you’ll find Spring Grove Farm, where the oaks are ancient, the mountain waters flow strong and cricketing traditions stand firm. When it’s their turn, the Mill Cricket Ground (MCG) at Spring Grove hosts The Midland Bat, the oldest active cricketing competition in South Africa. 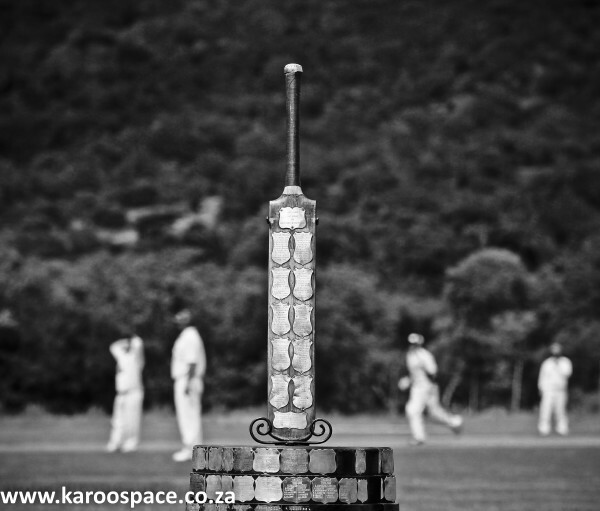 Launched in 1891, The Midland Bat is contested in early December between the Standard Cricket Club of Cradock and a Bedford XI. The Bedford fellows usually come with old Settler surnames like Pringle, Trollip, Hartley and Pitman. Cradock is a bit more of a mixed bag, with families like Copeman, Collett, Van Heerden and Du Toit in the team. One of the Standard Old Boys was the late Michael Antrobus, a well-known Cradock farmer whose name is etched on a winner’s plaque attached to The Midland Bat. “It wasn’t always easy gathering up 11 men who could hold a bat,” Michael told us once. “Shortly after the war (WII), my father would resort to phoning one of the Cradock hotels to ask if there was someone around who could play cricket – a staff member or a guest, perhaps. This is a short extract from Road Tripper: Eastern Cape Karoo by Chris Marais & Julienne du Toit. It’s a delightful traveller’s companion available from selected shops and in Print Format HERE and in Ebook Format HERE. How do I contact Chris Marais? I have done some research on the Standard Cricket Club in Cradock. That’s excellent! You can contact Chris on features@global.co.za or info@karoospace.co.za. I would have thought that Lochart Ainslie would be too short to open any bowling attack! Great piece on a quirky fragment in the tapestry of SA’s rural landscape.